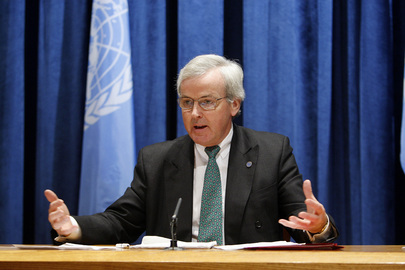 UNITED NATIONS, August 26 -- Asked about Sri Lanka on his final day as UN Humanitarian Coordinator, John Holmes offered a defense of his department's funding of the government's internment camps while admitting the government may have “deliberately shelled” civilians and hospitals. Video here, from Minute 17:29. Inner City Press asked Holmes about criticism of his and the UN's actions in Sri Lanka, for example pulling out of Kilinochchi, funding the internment camps and failing even now to get to the bottom of the murder of the Action Contre La Faim humanitarian workers. Video here, from Minute 14:30. Holmes called this the “ACF massacre,” and said it has still not been explained or even investigated. He did not explain the Kilinochchi pull out, which has been criticized including the International Crisis Group. He said there's a need to know how many civilians were killed, when it was his OCHA unit which stopped reporting on civilians casualties when one of their reports was leaked to and published by Inner City Press. Holmes began his answer by referring to the “heavy propaganda claims on both sides.” It was not clear if, beyond side of the the government and “Sinhalese extremists” -- to use Singapore's Lee Kwan Yew's description of Mahinda Rajapaksa -- Holmes meant the LTTE Tamil Tigers, or the Tamil diaspora. 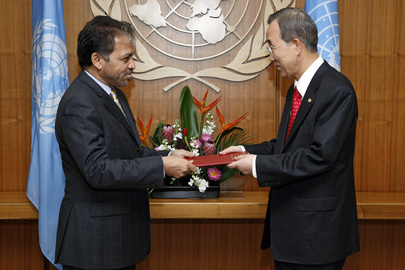 As Inner City Press reported at the time, during Ban Ki-moon's trip to Sri Lanka in May 2009, Holmes during an on the record briefing on the UN plane said that he got lots of email from the Tamil diaspora alleging for example bias by Ban's chief of staff Vijay Nambiar. I just delete it, Holmes said of the e-mail. Later after complaints, Inner City Press tried to soften the story. But that is what he said. And since he said it, information has emerged about Nambair's still unexplained role in telling LTTE leaders who wanted to surrender to come out with white flags. They were killed, and the leader of the unit which did the killing is now reportedly coming to the UN as Sri Lanka's Deputy Permanent Representative. Holmes is headed to a think tank of sorts, Ditchley Hall. Perhaps he will write a book -- and perhaps it will address these issues. We'll be watching.